1. Peel orange, removing all white. Slice thinly then divide into small pieces. 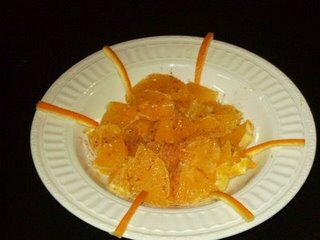 Drizzle orange blossom water over oranges, sprinkle sugar and cinnamon. Finley cut peel into slices or other shapes for decoration. Wow!Looks great... :mashsa01: Thanks for sharing sister Umm-Talal.